Our remodeled PREMIERE villa has been professionally decorated with designer furniture and linens. Both full bathrooms have been fully renovated with Italian tiles. Our third floor villa has tropical views and the building has its own boardwalk to the beach. Our unit has been created as your own relaxing sanctuary. The living room has two leather sofas, with a beach-washed armoire and a 36' flat screen tv/dvd and original art of Kiawah Island. The dining area has an oversized table and seating for 6. The kitchen is fully equipped with everything for your family's eggs-and-bacon breakfast, picnic out on the beach or fancy birthday dinner. The kitchen has granite countertops, beach-washed cabinets, breakfast bar and stainless appliances. Also,off the living room is a fully furnished balcony. The master bedroom is a restful retreat. The custom design turtle headboard is a sure delight. The king size bed has designer linens and new mattresses. To make your visit more comfortable, it also has a wall mount flat screen tv/dvd, and a pirvate balcony with great furniture to enjoy your lush tropical views. The second bedroom offers two queen size beds, new linens and mattresses, and local Kiawah art. It also offers a wall-mount flat screen tv/dvd and priovate balcony with furniture. Kiawah Island is located only 19 miles from the bustle of Charleston. Kiawah Island is rated 1# Golf Resort by Travel and Leisure, 2# Tennis Resort by Tennis Magazine, top 10 Best Family Resort by Family Life Magazine and raked as one of the top 10 beaches in the United States. Kiawah Island has over 75 miles of bike trails and 10 miles of private beach. The New pool and children's water park is just across the street. This villa is maintained by the Kiawah Island Resort and entitles you to Resort privileges and amenities at no extra charge. Exclusive use to resort pools, gym, concierge staff, island transportation and resort charging privileges. We are located in the serene West Beach. We are very convenient to Freshfields with numerous retail shops and restaurants. We have free WiFi for your convience. *You must be at least 25 years of age to rent this villa. We are very hands on owners. We visit our property 4-5 times a year, making sure everything is in premier shape. Our unit is in a very convienent location. We are between Freshfields and Night Heron, easy bike ride to either location. We love just walking off the elevator and stepping onto the boardwalk, less then a minute walk to the beach. Our building in on the ocean with its own boardwalk, we are on the third floor with tropical tree views, no ocean view. Great kitchen table, sitting for 6, great for dinners or game night! (3) Each bedroom has its own private balcony and the third balcony is off the living room. With your resort privileges, you have use of the new pool across the street from our villa or the Night Heron Pools....its your choice! New adult and childrens pool/park opening June 2012, just across the street from Shipwatch, less than a minute walk to the new pool amenity. Wonderful place for a girls weekend or a family trip. We had such a wonderful time here we highly recommend it and will definitely be back. Great location, literally just steps from the beach! The Shipwatch seems like an older property but the Villa is well maintained and updated. Someone mentioned the main bedroom being a little warmer than the second and I would agree. However, I loved my stay in Kiawah. It’s an incredibly beautiful island and it was such a bonus to have shuttle privileges and access to other resort amenities. Nancy was very responsive to messages as I was worried about hurricane Florence. This is definitely a great value and I would highly recommend it! So glad you enjoyed your visit at Shipwatch and Kiawah......and glad you didn't have to worry about the hurricane! Great property! Located just off the beach and a short walk to West Beach Pool! Our family loved it! Great location, especially with young children!!! Sounds like your family had a great summer vacation at the beach....always thrills me knowing so many good memories were made and glad you enjoyed our villa! 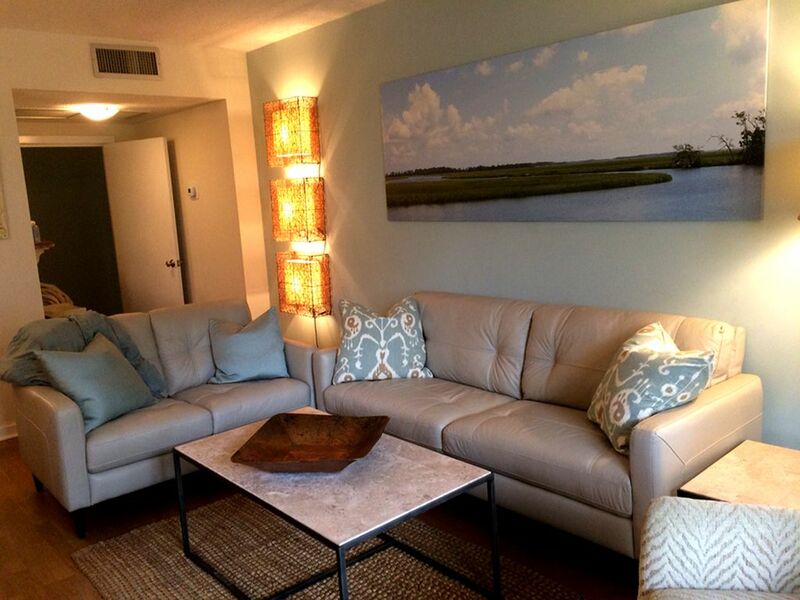 Loved the proximity to the beach, quiet condo, plentiful space, and multiple balconies! We ate most meals in. Cooking was easy and space for eating plentiful and comfortable. Internet access was fantastic. Wished that housekeeping left a condo for 6 with more than one roll of TP, one roll of paper towels, and four bath towels for the week, but those were minor details. FYI: We had never stayed at a Kiawah property without in condo laundry. This one does NOT have laundry in the condo and the complex laundry room is outdoors, so unable to dry things in the summer months despite multiple cycles in the dryer (due to outdoor humidity)...so do not plan on the ability to wash towels, clothing...we wish we would have known this in advance as we'd always had a functional laundry set up within our condo in the past. Certainly not a deal breaker, but would have packed additional towels and clothing. Glad you enjoyed your stay in our villa! As for towels, sheets and paper products as I mentioned in your information letter anytime you need anything at all, just dial housekeeping the number is set on all phones and they will bring any household item to you within hours and remove any towels etc. if requested. When Shipwatch was built, laundry facilities were not included in the villas but there is laundry room on each floor with no cost to guest. Our family had a great time in this well -located villa. Just the right amount of space and steps away from the beach. Super convenient and overall wonderful and comfortable stay! Nancy was very responsive to my questions about happenings on Kiawah during Memorial Day weekend. Highly recommend! We had a wonderful time in spite of a few cloudy, rainy days! I didn’t bring it from Seattle hahaha. The condo is beautifully decorated as described with great access to the beach which is so important with a toddler. I love all the different balconies to sit around and relax. We will definitely rent this home again when we visit next time. The whole resort is so well maintained. Thanks Nancy for sharing your lovely home. So glad you had a great time despite a few cloudy days...just wanted to make you feet at home! Remember those days with the toddlers and teens always enjoyed the beach right off the boardwalk, made my life so much easier!